Oh my first hot off the stamping press post of the new year and of course it features MoYou London's latest collection! I am as always thrilled by the thought of any new plates coming out especially from some of my favorite designers. 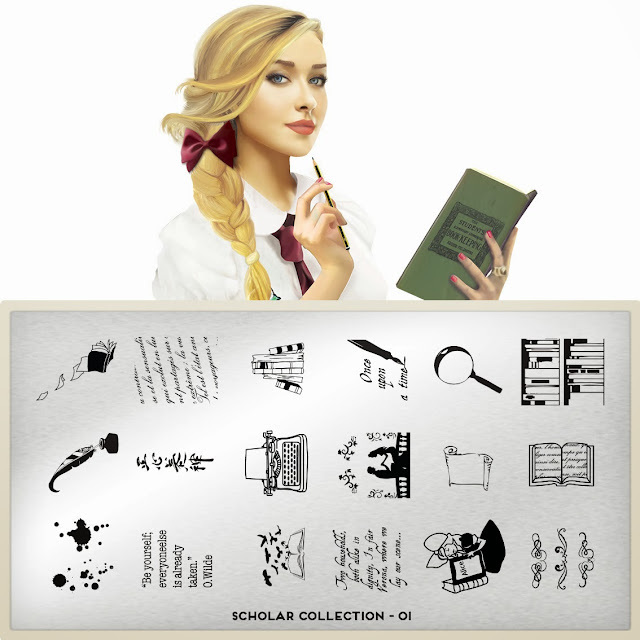 So without further ado let's see what the Scholar Collection is all about! The above plate reminds me so much of two different plates from two separate brands the Messy Mansion Scriptorium plate and a plate by Vivid Lacquer which also has various scripts and quotes on it. I guess books are really in lately! I love that this has the opening lines from Billy Shakespeare's Romeo and Juliet. Uncivil blood making civil hands unclean and all that jazz. Yes! Yes! Yes! Shall I say it again? Thank you lord for plate makers realizing how many she-geeks there are in the universe! I love it! Again very similar themes to plates released by Messy Mansion and Vivid Lacquer. I have to say the biochemist in me is really loving these plates. Best of all the organic compounds are actually correct at least on preliminary inspection! The pill shapes reminds me of days spent suffering in P-chem lab. I really want to see some codons on plates next! This is clearly the cutest and most adorable plate, but I find myself thinking this could have easily slipped right into the Princess Collection or Suki Collection without a hitch. But then again I never ever doodled on my notes not even now. Not sure how I feel about this one being in the Scholar Collection. So there we have it the Scholar Collection! What do you think? I have to say I wanted to love this collection more. It's by no means disappointing, but when the last two collections released, the Explorer and Fairy Collection, I had to pick my jaw back up off the floor I was so blown away. These I feel are a bit, just a bit mind you, lacking in that same wow factor appeal. I think I was imagining more of a Magic School Bus feel to these plates when I first saw the announcement for the release. I also wanted to see some fresher ideas than what I have already seen from other plate makers. That said I know as usual the quality on these will be excellent. The plates are available for purchase and start shipping on the 3rd of January (today). They retail for 4.99 Euros and can be purchased on the MoYou website. Happy stamping, thanks for reading and see you next post! Looks like a cute stamping set. I really like the math & science & histroy themed plates. 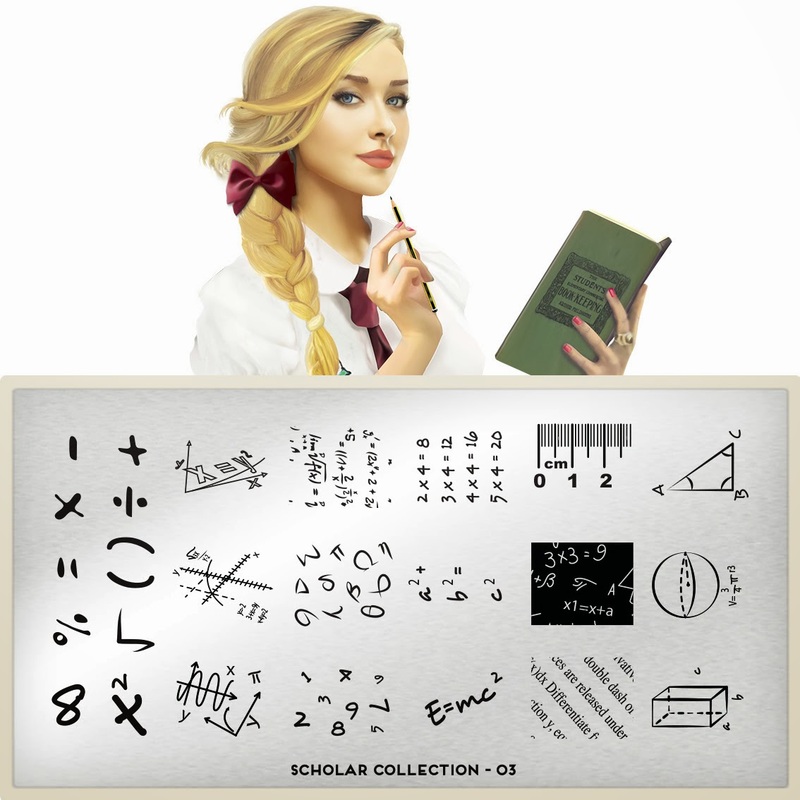 Not sure I really support how MoYou is adding in the "doodles" as part of the scholar collection. I agree with you that they would be a better fit in a different release. Especially with this release they had a chance to portray a stronger image of women with education... But nope! we're only really doodling hearts, X's & O', and butterfly's, *eye roll*. Its not really the doodles I mind, it just seems disproportionate (plate image wise) to the scholar aspect. I liked reading your thoughts on each plate and found my-self nodding in agreement with everything you said. Hey Karen! Thanks for stopping by and yes I agree I expected a touch more from this collection than what I saw. I think when I read the description of Kelly I was already mentally thinking hmm that's not how I would describe my pursuit of education. I know stamping is fun and all but the best plate makers know how to mix fun with the passions that drive us everyday. 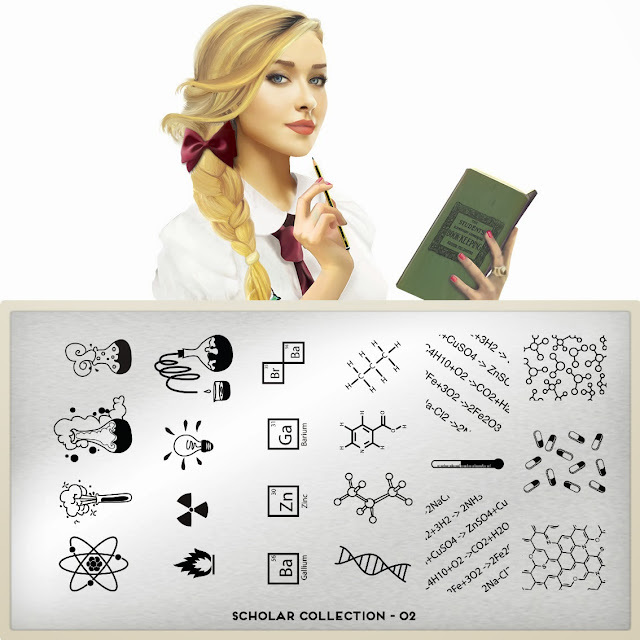 The history and science plates are great, but somehow I can't see Madame Curie becoming overly excited with the thought of future generations of girls doodling away in a corner or texting on their phones it class. It's a touch juvenile, but I tried to just approach it with a bit of levity. I think you won't be disappointed in the quality of these plates for sure! I'm holding off on this collection since there are several others including the Fairy and Explorer collection that I want more. I am so getting these!! I love any plates with scripts!! Lol Moore I had a feeling you would be! I'm holding off on this collection. Actually as a biochemist I'm really a bit disappointed in these plates. All the errors in the formulas on the math plate and then even the last plate with the alphabet is missing the lower case letter y. It would drive me insane to look down and see the formula is wrong every single time. The best plates from this collection IMO are 1 & 2 so maybe I'll only get those. Thank you so so much for your "this plate looks like" when it came to the first plate in the collection. I cannot get the MoYou Scholar collection here in the US and your comparison with Messy Mansion's plate MM24 helped solve a day-long internet search for me! Thank you! Your totally welcome! I never thought my comparisons would help. If you are wondering the Messy Mansion plate is MM24 I'm not entirely sure about the Vivid Lacquer one but she definitely has a script and science based plate was well!